The muscles that surround the eyes - the circular orbicularis oculi muscles. When these muscles are worked, the small eyelid (palpebral) muscles are also worked, preventing hooding in the upper eyelids and the pooling of fluid in the lower eyelids. The muscle that surrounds the mouth - the circular orbicularis oris muscle. When this muscle is worked correctly, other smaller muscles of expression, like the zygomaticus, the buccinator, and the risorius are also worked. The muscle of the chin - the mentalis muscle. When this muscle is exercised, the muscles at the front of the neck will also be brought into play. The muscles at the front of the neck - the platysma and sternocleidomastoid muscles. These muscles when they are toned up give a vigorous, vibrant, youthful appearance to a person. The exercise for these muscles also improves the jawline, making it cleaner. The muscles of the head - the frontalis and occipitalis muscles at the front and back of the head. When the occipitalis muscle is brought under control and toned up, it will give a pleasing lift to the eyebrows. Gaining control of this muscle, especially for women, involves some hard work. Once the exercise for this muscle is mastered, though, it's easy to do and even refreshing. 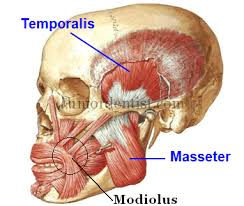 The jaw muscles - the masseter, temporalis, and others. You don't have to be concerned about these because they get enough exercise when you chew food. The six exercises that follow will give you a natural, noninvasive program for rebuilding and maintaining tone in all the facial muscle groups. The facial muscles on each side of the lower face converge and interlace to form a compact mass called the modiolus (mo-dí-o-lus). The muscles radiate from this round fibro-muscular mass like the spokes in a wheel. Other muscles of expression that I did not name on the facial map also insert into this hub: the zygomaticus major and minor, the risorius (the smiling muscle), and the buccinator. If at any time while doing a certain exercise you feel strain or pain in the back of the neck, my advice is to stop for a while. The sensation of strain or pain means that you have not "isolated" the individual muscles you are working. This is especially true when you are in the early stages of doing the scalp exercise. This is a tough exercise to learn - it's hard to gain control of the occipitalis muscles at the back of the head. Some people in their effort to do this exercise put unnecessary tension on their jaw and neck muscles. When the facial exercises are done correctly, there should be no tension in any of the muscle groups that are not being worked. The facial muscles form a complex network under the dermis and subcutaneous layer of the skin. They move with and against each other to form hundreds of subtle and not so subtle expressions. These facial muscles are all intermeshed with each other, some on the top, some on the bottom, and some in between. The skeletal muscles are all attached to bone by way of tendons - they contract to help us move our arms and legs. Many, although not all, of the facial muscles, in contrast, begin and end with each other or insert into the facial skin. When the brain gives messages to these muscles by way of facial nerves, they either relax or contract. This moves the face to form all of our myriad facial expressions.